The all-new 2019 Kia Soul EV surfaces and we get a look. The upcoming Soul EV will share a platform with the Hyundai Kona Electric and Kia Niro EV. This means it might come with a 64-kWh battery pack and a range of some 215-240 miles (~300-350 km), though it could only be offered with a smaller, 39.2-kWh battery pack, much like the base Kona. However, we don't expect the Kona's smaller pack to be available in the U.S., so we'll see what happens in regards to the Soul EV. The current 2018 Kia Soul EV - which is still available to order - is good for an EPA-estimated 111 miles of range. It comes with an updated 30-kWh lithium-ion battery pack. The previous 27-kWh pack offered only 93 miles of range. So, the trendy, spacious crossover will see a significant and much-anticipated range bump for the 2019 model year. We also speculate that with Kia's move to the new platform, CHAdeMO will go away and a CCS Combo fast charging inlet will be offered. Automedia snapped these spy shots near Lapland, Finland after the upcoming Soul EV was undergoing extreme, cold-weather testing on a frozen lake. According to the information provided, the vehicle may actually offer an all-wheel-drive option, which has never been available in the past. 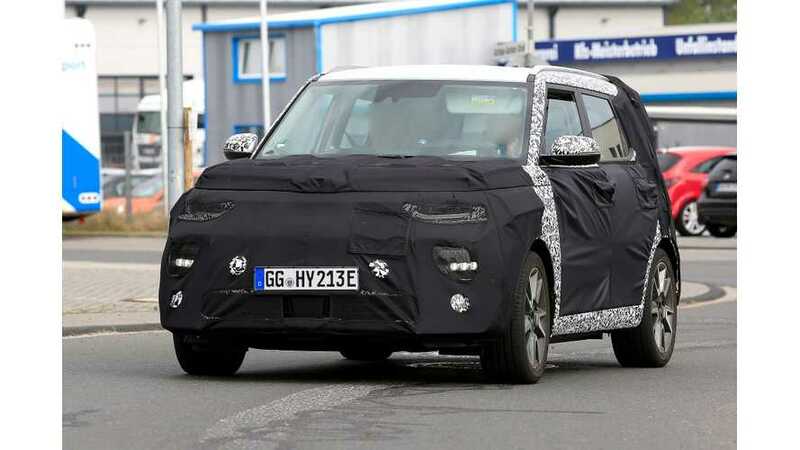 We don't have any official information about the unveiling and release date for the 2019 Kia Soul EV, however, we expect to see it at one of the upcoming U.S. auto shows later this year or early in 2019.